1. 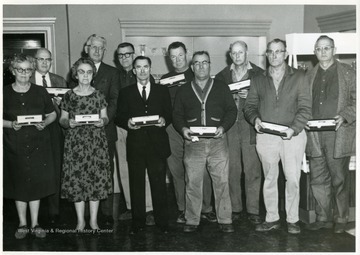 40 Year Employees of Fostoria Glass Company, Moundsville, W. Va.
40 Year Employees of Fostoria Glass Company, Moundsville, W. Va.
Group portrait of glass workers. 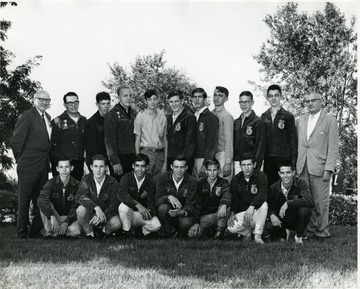 From left to right, Front Row: Della Burckett, Cythia Dunlap, Bruce Montgomery, Albert Wheeler, Floyd Carney, Cecil Coffield; Back Row: Eldon Fox, Michael Grubber, Orville Bickerton, Norman Greenan, James Pelley. 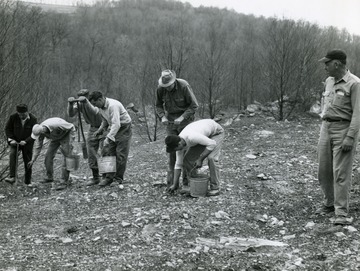 Farm workers planting seedlings in rocky soil. 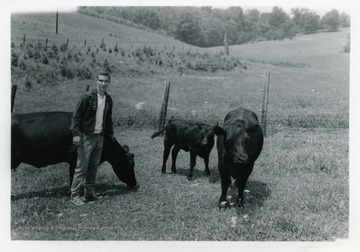 Scott Henry standing beside his angus cattle. 4. Phillip Gregg and Richard Glass, Morgantown, W. Va.
Phillip Gregg and Richard Glass, Morgantown, W. Va.
Richard Glass a member of F.F.A. 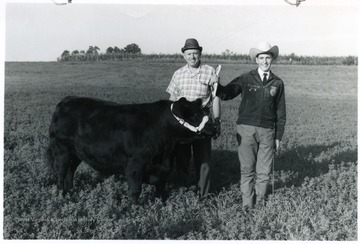 stands next to Phillip Glass while holding the tether of a steer on the Gregg farm. 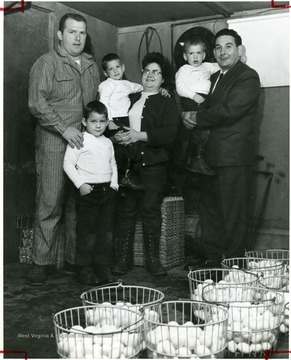 Group portrait of a family standing next to baskets of eggs. Left to right: Robert L. Kelly Robert William, 5 Richard 4, being held by Mrs. Kelly; and Charles 3, being held by State Director Manchin. 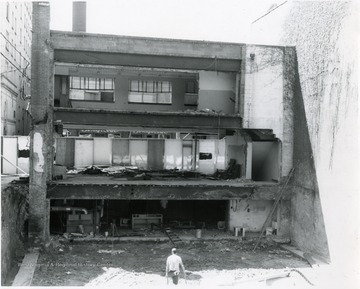 The U.H.S. VoAg judging team for FFA, which took second place in a sweepstakes. 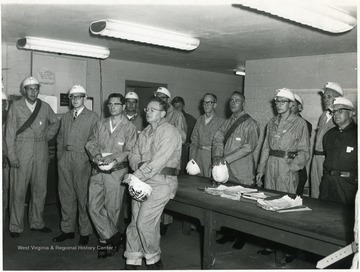 Group of miners in a safety class. 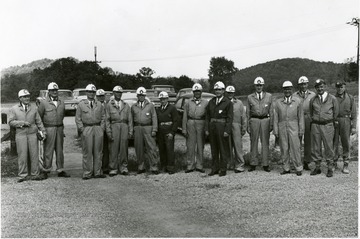 Men in suits with coveralls over top of them wearing hardhats and head lamps. 9. 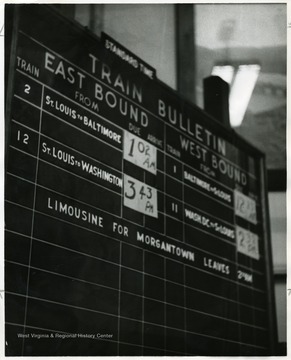 Train Schedule Board, Grafton, W. Va. Train Schedule Board, Grafton, W. Va.
East Bound's train schedule from St. Louis and West Bound's train from Baltimore and Washington D.C. are listed on the Train Schedule Board in the train station at Grafton, W. Va.
10. Site of Kiddytown in Morgantown, W. Va.
Site of Kiddytown in Morgantown, W. Va.
11. 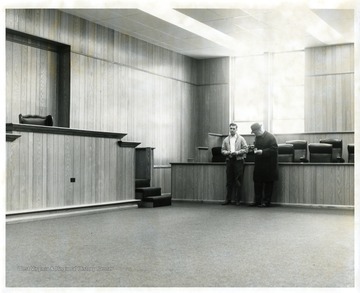 Redecorated Monongalia County Courtroom, Morgantown, W. Va.
Redecorated Monongalia County Courtroom, Morgantown, W. Va.
Two men are standing in a redecorated Monongalia County Courtroom in the Courthouse in Morgantown, West Virginia. 12. 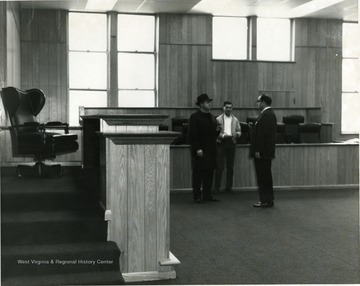 Redecorated Courtroom in the Monongalia County Courthouse, Morgantown, W. Va.
Redecorated Courtroom in the Monongalia County Courthouse, Morgantown, W. Va.